PRODUCT: #136040 PROPAC 7/8" EG RING SHANK CAP NAIL WITH PLASTIC ROUND CAP. FITS NV50AP SERIES NAILER. 2800/BOX. PRICE/BOX. Box Quantity: 2,800 (each, caps and nails). The Plasti-Tacker® Plus has a fastener capacity of 350 nails and caps, available in Plasti-Top® and Round-Top® ProPac™s. 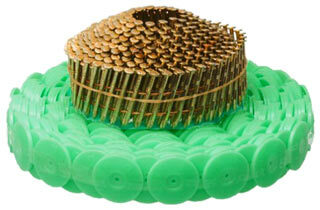 Each ProPac contains 8 coils of ring shank nails and 8 reels of collated caps providing 2800 fasteners per ProPac. Fasteners are available in 7/8”, 1¼”, and 2” lengths. Round-Top steel cap fasteners provide greater holding power too. Heads don’t pop off and the low smooth profile prevents mop snags and bulging in multi-layer roofs. when used for built-up modified and single ply on nailable wood roof decks.